Situation Vacant - ZineWiki - the history and culture of zines, independent media and the small press. Situation Vacant was a punk and industrial zine produced in the UK. Emerging in the late 1970s in Derbyshire, UK, Situation Vacant was edited by Glynn Lennoy and Martin Roper, with contributions from Dugi Bell, Andy, Bosa, and others. Photographs were by Russell Maw. The zine covered the punk and industrial music scene. Issue 2 was released in May, 1978 with a cover photo of Debbie Juvenile. Featured were interviews with T.V. Smith and Gaye Advert of The Adverts, and Jimmy Pursey of Sham 69, an article on the Rock Against Racism Anti-Nazi Carnival, andreviews of live shows by The Vibrators, Cherry Vanilla, X Ray Spex, Patrick Fitzgerald, The Clash, Tom Robinson Band, Steel Pulse, etc., and reviews of recordings by The Buzzcocks, Ian Drury, Magazine, The Only Ones, Penetration, Radiators From Space, Tom Robinson Band, and XTC. 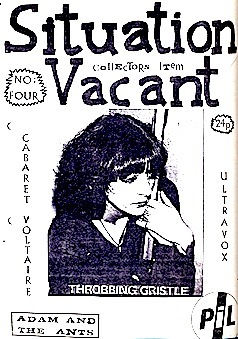 Issue 4 featured a cover photo of Cosey Fanny Tutti of the band Throbbing Gristle. Included were articles on Cabaret Voltaire, Ultravox, Adam and the Ants and PIL. Martin Roper, Dugi Bell and Russell Maw later went on to form the band Anti Pasti. This page was last modified on 29 March 2018, at 13:12.